Who’s into the 2015 Freeride World Tour? After a grueling season spanning 43 of the world’s premier ski resorts, the 2014 Freeride World Qualifier tour is over. Jaw-dropping action and suspenseful last-minute ranking changes made FWQ 2014 one to remember. After the final event of the year in Big Sky, USA, 16 riders from the four disciplines have secured their spots on the 2015 Freeride World Tour. Rider ranking on the FWQ is broken into two regions — Region 1 draws athletes from Europe, Asia, and Oceania, while Region 2 encompasses North and South America. This year the top three ski men, two snowboard men, two ski women and one snowboard woman from each region are advancing to FWT 2015. That is six fewer riders than last year, a sign of the ever more competitive and elite rider pool at the top level. A record number of events — 36 — took place in Region 1 countries this season, offering riders more chances than ever to gain experience, travel and build their ranking. Snowboard Women winner Anouck Mouthon (FRA) worked hard all year, competing in seven events, and she will join her sister Elodie Mouthon (FRA) on the FWT next year. For ski women, Lotten Rapp (SWE) took the overall victory, followed by Silvia Moser (ITA) who will be the first female Italian FWT rider since Giulia Monego. In Snowboard Men, though Flo Orley (AUT) won the points race, he had already successfully maintained his spot with solid results on the FWT, so the second- and third-ranked riders qualified — Camille Armand (FRA) and Alexander Hoffman (AUT). For ski men, Léo Slemett (FRA) took a well-deserved tour victory, capped with a win at the 4-star event in Nendaz, Switzerland. Slemett originally qualified for the FWT by a third place at the FWQ in 2012, lost his FWT spot after 2013, and will now be back in the big leagues in 2015 after his stellar performance this year. “I took my FWT experience back to the FWQ and that really helped me progress. But the level on the qualifier tour is really impressive! The riders give 100% because they have nothing to lose – if you’ve never seen an FWQ 4-star even you have to go,” said Slemett. He was closely followed by Fabian Lentsch (AUT), whose insane winning run at the event in Obergurgl quickly went viral online. Jordan Bricheux (FRA) took the third and final spot. Difficult conditions in the Americas saw a handful of cancelled events, making the seven remaining events especially intense for Region 2 competitors. For Women Snowboard, Mary Boddington (USA) turned in a convincing victory, only entering three events but winning every one, beating her nearest challenger by 1,600 points. Ski Women champion Hazel Birnbaum (USA) started her winning campaign back in August when she won the first 4-star event of the year at El Colorado, Chile. Ashley Maxfield (USA) took second, regaining her spot on the FWT after losing it in 2013. 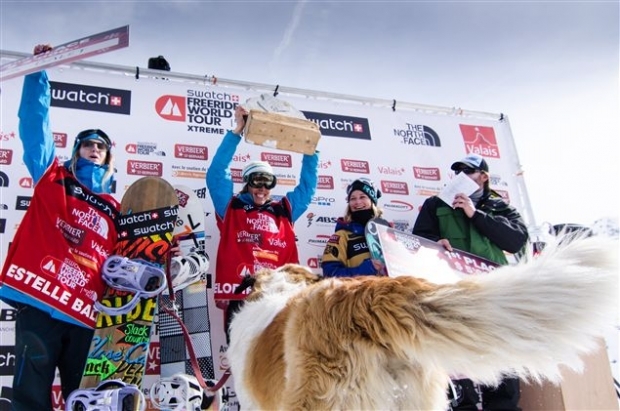 The Snowboard Men winner was Colin Boyd (USA), a 2014 FWT rider who placed below the FWT cut, but re-won his spot by winning two consecutive late-season events in Vallnord-Arcalis, Andorra and Telluride, USA. Galvin Christopher (USA) secured his spot with a second place finish at the final event of the year in Big Sky, USA. Kyle Taylor won Ski Men, capping off a hard-fought season featuring a victory at the 4-star Crested Butte, USA event and a second place at the finale in Big Sky. Juan Bergada (ARG) will join fellow Argentine skier Nicolas Salencon on next year’s tour. 21 year-old George Rodney (USA) rounded out the qualified men and will be one of the youngest riders on next year’s FWT. There seems to be no limit to the FWQ — the level of riding continues to reach unbelievable heights and more events are added every season. From Switzerland to Chile to Canada to Scotland – the list of host countries and partners continues to expand. And with the infusion of talent, passion and energy that the FWQ riders bring to the FWT, the sport looks to continue on its upward trajectory. Stay tuned, the show is just getting started! For more information on the FREERIDE WORLD QUALIFIER, please visit www.freerideworldtour.com.